There are a few different downloads available for the Rainbow Framework. 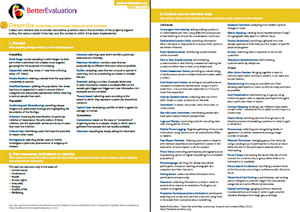 This downloadable version provides all the different options (methods and processes) that can be used for each task in an evaluation. This can help you to plan an evaluation by prompting you to think about a series of key questions. It can be used to develop a complete evaluation plan, or to undertake a discrete task such as documenting agreements in a Terms of Reference. This compact version of the Rainbow Framework focuses only on the evaluation tasks. 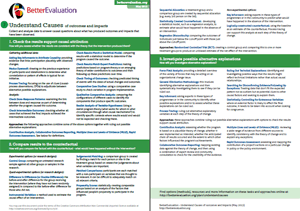 Download all seven of the Rainbow Framework's colour-coded clusters of evaluation tasks in one booklet. Download separate summaries of each of the Rainbow Framework's colour-coded clusters of evaluation tasks. Collect and retrieve data to answer descriptive questions such as what has happened in terms of the activities of the project/program/ policy, the various results it has had, and the context in which it has been implemented.